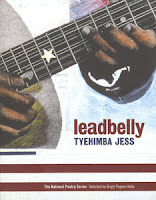 Nearly 6 years ago, when I saw notices about the upcoming publication of Tyehimba Jess's volume Leadbelly (2005), I wrote to his publisher and requested an advance copy. I was intrigued by the early poems I was reading and wanted to write about the book for Sou'wester magazine. Many of the poems from Leadbelly impressed me, and I was especially moved by Jess's poem "1912: Blind Lemon Jefferson Explaining to Leadbelly." I was struck by the written version of the piece, which I encountered about the same time as the audio version of Jess reading the poem on the site, From the Fishouse. The premise of "1912" is that blues singer Blind Lemon Jefferson is giving Leadbelly advice on how to survive the hardships of a tough, uncaring world. Jefferson should know: he had to make his way in an environment "desperate enough to pin a blind man’s back to the / ground for all the money he can’t never even see." Jess assumes the persona of Jefferson in the poem, and so throughout the piece, he is effectively communicating from the perspective of a blind black man. Early on, Jefferson instructs Leadbelly to read sensory cues from the audience by distinguishing between the "plunk of a nickel," "the bang of a quarter," and "the smell of thieves schemin’ on a blind man’s cash." Jefferson explains that during one of the times that he was out of work he was "broke enough to wrestle men for carnival money." After Jefferson bested one foe three times, the angry adversary decided to use a knife. No one warned the blind man that he was in danger, and instead the crowd "had they bets on how hard i was gonna bleed." The audience underestimated Jefferson's chances and lost their money. With his winnings, Jefferson retrieved his guitar from "the pawnbroker’s grip." The experience provided the musician with the knowledge, which he was now passing along to Leadbelly, that "that box o’ strings" or guitar was "a ticket out of nowhere," but "you gotta wrestle for it, son. you got to..."
The scene that Jess creates of Jefferson relaying a lesson to Leadbelly is convincing and compelling and provides a memorable possible scenario of how musicians acquired and shared life lessons with one another. Over the years when I would read "1912" aloud to my students and friends, I was often emulating aspects of how Jess performed the poem in the Fishouse reading. His voice is somewhat low and firm invoking the sense that it is a personal conversation between Jefferson and Leadbelly. Part of the appeal of the piece is that we get the chance to overhear one legendary musician sharing inside information with another. Long before his book Leadbelly, Jess had established himself as a skilled performer of verse as a member of the 2000 and 2001 Chicago Green Mill Slam team. He had likely developed his skills before his participation with the team, and has continued to hone his talents as a presenter and performer. But while spoken word and slam pieces tend to have a public feel designed for a broad audience, "1912" presents a private exchange, evidenced by how Jess read the poem aloud. I later heard Jess read the poem in front of an audience, and he gave Jefferson a stronger Southern accent to Jefferson, and since he was presenting the poem in front of a large crowd, Jess was inclined to raise his voice. That version of "1912" occurred in the context of a a larger amazing performance, so I enjoyed the poem on those terms. But the previous audio version remained interesting as I continued to think about Jefferson mentoring Leadbelly, and as I also considered the kind of whispery voice that Jess employed as an example of an experienced poet performer finding a way to recreate a private moment between two musicians. I've re-read and heard Jess's "1912" enough now to where I know the poem by memory. The poem is so memorable because of its vivid scenes. Ironically perhaps, those vivid scenes are expressed by a blind man. Thanks HR, I didn't even know such a book came out ! Your blog is a pan african american education!